One of my buddies at work today just purchased his first mac. He was puzzled on how to log into OS X when the computer is first started without entering his password every time. Here are the steps to disable that pesky password requirement. First of all, let me say why you should not do this. If an unauthorized personal accesses your computer, they will be locked out if they restart the system. (Yes, its pretty trivial for an experienced hacker to get your personal account password if they have access to your physical system. However, most common thieves and random people are not going to know how to do this.) Having that login password requirement does give you an added element of protection. However, if you are like me and accept the risks, you can setup your mac where it automatically logs you into OS X whenever you start your system. 4. Click the lock at the bottom right-hand corner and enter your password. This will allow you to change this information. 5. Uncheck Disable automatic login and enter your password. 6. If you find passwords annoying, you may want to make sure that Require passwords after sleep or screen saver begins is disabled too. 7. Click the lock again to “lock” your changes. 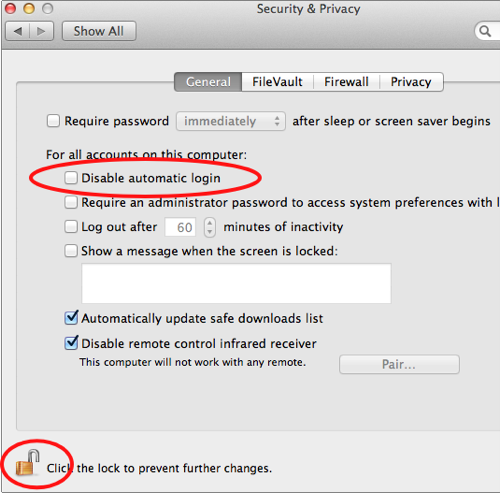 Now when you boot up your system, OS X should start up without requiring your password.